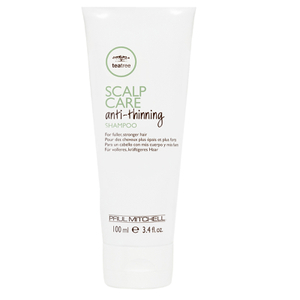 Enjoy fuller locks with the Paul Mitchell Tea Tree Scalp Care Anti-Thinning Shampoo; a sulphate-free cleanser that promotes thicker looking hair. 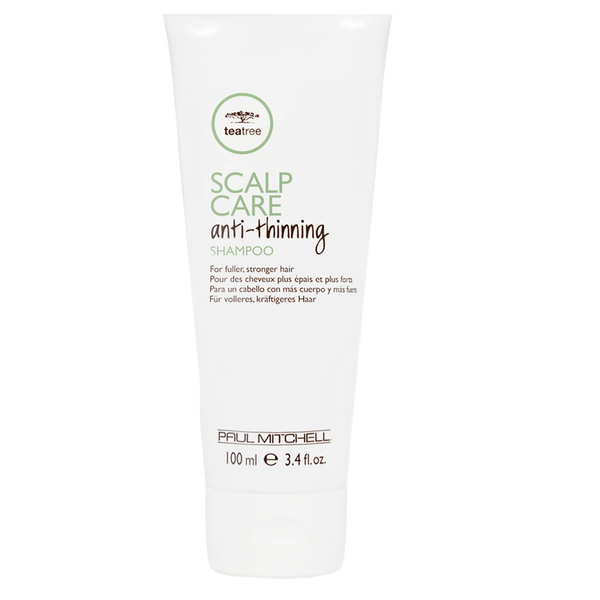 Utilising Paul Mitchell’s exclusive Regeniplex® blend, which intelligently combines Kakaku Plum, Pea Peptides and Ginseng, the shampoo thoroughly cleanses the fiber and stimulates the scalp. The effective formula gently removes impurities and encourages volumised results by visibly thickening each strand. From first use, the shampoo boosts weak, fine and lifeless locks, leaving hair visibly full, clean and healthy. Aqua (Water, Eau), Sodium Cocoyl Isethionate, Cocamide MIPA, Sodium Methyl Cocoyl Taurate, Cocamidopropyl Hydroxysultaine, Sodium Lauryl Sulfoacetate, Sodium Methyl 2-Sulfolaurate, Coconut Acid, Glycerin, Divinyldimethicone/ Dimethicone Copolymer, Glycol Distearate, Panax Ginseng (Ginseng) Root Extract, Ganoderma Lucidum (Mushroom) Extract, Curcuma Longa (Turmeric) Root Extract, Prunus Africana (Pygeum) Bark Extract, Pisum Sativum (Pea) Peptide, Melaleuca Alternifolia (Tea Tree) Leaf Oil, Trifolium Pratense (Clover) Flower Extract, Terminalia Ferdinandiana (Kakadu Plum) Fruit Extract, Leuconostoc/Radish Root Ferment Filtrate, Disodium Laureth Sulfosuccinate, Sodium Chloride, Sodium Sulfate, Sodium Isethionate, Guar Hydroxypropyltrimonium Chloride, Glycol Stearate, Disodium 2-Sulfolaurate, Citric Acid, C12-13 Pareth-23, C12-13 Pareth-3, Disodium EDTA, Magnesium Nitrate, Phenoxyethanol, Methylchloroisothiazolinone, Methylisothiazolinone, Sodium Metabisulfite, Red 40 (Cl 16035), Caramel, Parfum (Fragrance), Geraniol, Linalool.